Below are brief descriptions of some of the greatest accomplishments in endurance running. Even if you've never run a mile in your life you have to respect these athletes for their achievements. Three men ran 4,000 miles across the Sahara desert in 111 days. Charlie Engle, Ray Zahab, and Kevin Lin ran the equivalent of two marathons a day for 100 days to become the first modern runners to cross the Sahara Desert's grueling 4,000 miles. They were stricken with tendinitis, severe diarrhea, and knee injuries all while running through the intense heat and wind, often without a paved road in sight. Temperatures varied from over 100°F during the day to below freezing at night. Typical day: up at 4:00am, run until lunch, eat, run until 9:30pm. Then get up and do it again... for 111 days. Xu Zhenjun ran a 3:43 marathon - backwards. In a world where 99% of people never finish a marathon in their lifetimes and of those who do, 90% don't run under 4 hours, Xu Zhenjun of China managed both, in reverse. I thought Zhenjun was a rare person who ran backwards for fun, but it turns out there are a bunch of people who prefer to run backwards. Timothy "Bud" Badyna, the father of backwards running (pictured right), has also completed a sub-4 marathon backwards and a 10K in 45:37. "I've trained through illness and injury, run plenty of times when I shouldn't have. I ran on the days my parents passed away and I've run when every one of my four kids was born. I still look forward to running every day, although the trees go by more slowly now." Covert is now the Cross Country Coach for Antelope Valley College (he knows a little about running). I guarantee his runners have trouble finding excuses to miss practice. 7 Days, 7 Continents, 7 Marathons. Sir Ranulph Fiennes and Dr. Michael Stroud went seven for seven during a grueling week of marathon running and transcontinental travel. 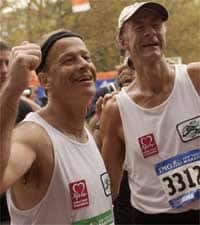 The pair ran seven marathons in seven days on seven continents from October 26 - November 2, 2003. The men ran in Chile, the Falkland Islands, Sydney, Singapore, London, and Cairo before completing their marathon of marathons by running the New York City Marathon. Besides battling the exhaustion that any marathon runner faces, Fiennes and Stround also had to battle jet lag and dramatic changes in temperature and humidity during each race. The feat was especially impressive for Fiennes, who suffered a heart attack just four months earlier. Ethiopia's Haile Gebrselassie's marathon world record. 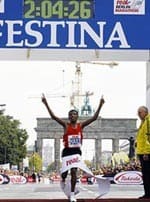 Haile Gebrselassie ran a marathon in 2 hours, 4 minutes, and 36 seconds in 2007, crushing the old world record by nearly 30 seconds. These days marathon winners are consistently throwing down times like 2 hours and 6 minutes. It's so common, I think we have forgotten exactly how fast it is. That is keeping a 4 minute, 48 second-per-mile pace for 26.2 straight miles! For a non-runner, it may be difficult to comprehend just how remarkable this feat is. Very few people in the world can even keep that pace for 1 mile. (1) - HEAT is the main nemesis, acclimate your body NOW!! Start using a sauna on your EXPOSED body. Do not wear any protective clothing. (2) - ENDURANCE is very slow to develop. 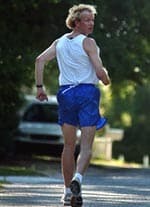 Set a target of being able to WALK, ONLY, at 20-30 minute per mile pace, NON STOP (NO SLEEP) for 24-30 hours. 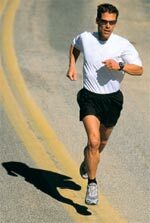 Do not exceed this pace, nor train in this way more than once a week. Dean Karnaze ran 350 miles non-stop. "The Relay" is a 200-mile, 12 person relay race. Not only did Dean Karnaze run this race by himself, he ran an extra 150 miles from his home to the starting point. Karnaze ran 80 hours straight and burned an estimated 40,000 Calories to cover the 350 miles. I couldn't even stay away that long, yet he kept a good pace the whole way. 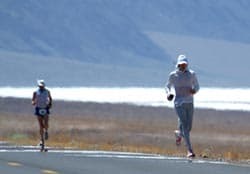 Karnaze has also has finished the Western 100 ten times, the Badwater four times, and most recently he ran 50 marathons in 50 consecutive days in all 50 United States.